Easy Freezer Friendly Whole Wheat Waffles: Light and fluffy whole wheat waffle recipe that packs a dose of whole grains for a healthy start to the day. Are you a pancake of waffle lover? Me??? I am totally on team waffle. I just love the crisp edges that taste slightly caramelized that you get on a waffles. Now don’t get me wrong, I won’t turn my nose up at a pancake. In fact, I have shared with you all SO many recipes for pancakes–Zucchini Bread Pancakes, Strawberry Cheesecake Pancakes, Sweet Potato Pancakes and PB & J and Pancakes just to name a few–there are many more! Why haven’t I shared more recipes like these Whole Wheat Waffles?? I really don’t have an answer for that either. But I think it is high time I share more waffle recipes! Waffles are not only a wonderful morning treat smothered in rich maple syrup, but make a wonderful lunch when served with a slather of peanut butter and a sliced banana. Or how about dessert with fresh fruit and freshly whipped cream, or ice cream layered on the top of the waffle with homemade caramel.…..yum. So many things to do with these whole wheat waffles and my mind and stomach are beginning to dream about different waffle creations. Regardless, this easy waffle recipes will definitely earn a welcome place on my family’s breakfast table and in my collection of favorite easy breakfast recipes. I use whole wheat flour because my family loves it and it is much healthier than enriched white flour, but use any flour you would like. Even Bob’s Red Mill Gluten Free Flour 1:1 works in this recipe to make these Gluten Free Waffles. Homemade Buttermilk: If you don’t have buttermilk, use one tablespoon vinegar or lemon juice and then fill measuring cup remaining way to 3 1/2 cups with regular milk. You can also make these dairy free by using the equivalent amount of non-dairy milk such as almond or coconut milk. Eggs may be replaced with flax eggs or vegan egg replacement product. When you make homemade whole wheat waffles, make a triple batch so you can have some in the freezer at all times for an easy breakfast on a busy morning, or a quick snack at any time of the day! To freeze waffles for individual servings, allow waffles to cool. Place on a cookie sheet in freezer in a single layer until flash frozen–about 30 minutes. Place into freezer container for storage. This allows the waffles to be removed from freezer one at a time. Toast in toaster or toaster oven. You can also place in microwave for 1 minute per waffle. The waffles will loose their crispiness when microwaved, but still tasty! 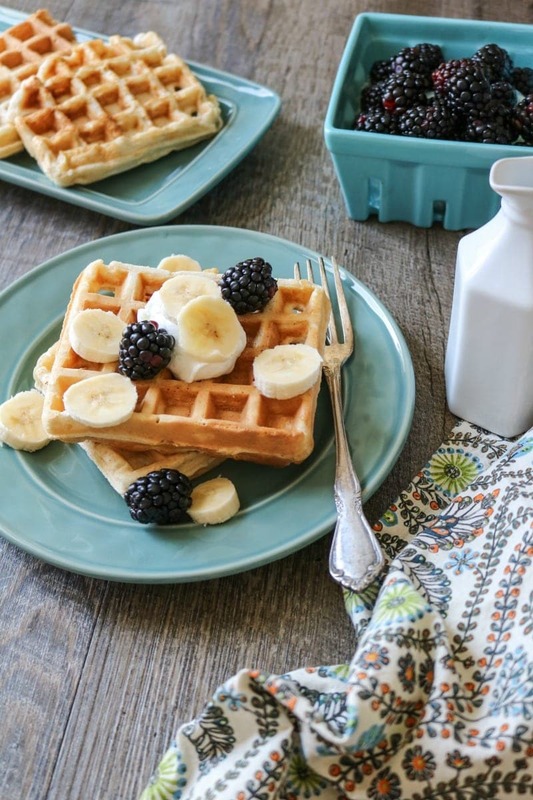 Simple, wholesome waffle recipe that is sugar free and made with 100% whole wheat flour. Whisk the dry ingredients together in a large mixing bowl. In a separate bowl, combine the remaining wet ingredients and add to the dry ingredients, incorporating the two mixtures well. Allow batter to sit while the waffle iron is heating up. Once the waffle iron is heated, brush with canola oil, coconut oil, or butter. Ladle your batter unto the waffle iron and cook according to the manufacturers instructions. Serve with any topping you desire. What a hearty and satisfying treat for breakfast or brunch. My family will love this! Do you think this recipe will work with vegan egg replacer and almond or coconut milk? Thank you so much for sharing this healthy and delicious whole wheat waffle recipe at the Healthy, Happy, Green and Natural Party Blog Hop. I’m pinning and tweeting this recipe! These absolutely work with egg substitute and any vegan milk. My nephew has a severe egg allergy and so I have personally made them with “flax” eggs and also with unsweeetened canned coconut milk…that coconut flavor is dynamite!! I am sure almond or soy milk would work as well. I will edit recipe to include notes to make vegan. Oh you poor thing!! When we were gluten free and vegan I had to resort to buying a frozen product or buckwheat…..which was just not the same. You definitely need a batch in the freezer for yourself. These are just perfect. The recipe looks great. I’m so with you. I love a nice crunchy waffle. Crunchy is where it is at! Love how healthy and delicious these waffles sound, especially without any sugar added. I might add in a little vanilla because I love it. Thanks! Vanilla would be fabulous in this batter for sure! These waffles look delicious Kristen! I’m with you, waffles win over pancakes any day. I love that they are freezer friendly – I always make too many! Although keeping some for dessert with vanilla ice cream and caramel sauce sounds perfect ???? These look amazing! And I love the healthy twists—I’ll take mine with berries and cream! Oh yes, berries and cream sound perfectly delightful Liz! I’m honestly lean more towards team pancake, but your waffles may convert me! Pancakes are NOT a bad thing! But I think you should have both Rachelle! I love having waffles frozen in my freezer for quick breakfasts-or even quick dinners! Love this recipe! They do make a great dinner–or brinner option for sure! What is the amount of oil to use? 1/2 what? AH, great catch–sorry about that! It is 1/2 cup. I am excited to try this recipe. Thank you for this! Is the serving size 1 waffle? These came out perfectly! I made extra for the freezer. YAY!!! I love hearing that! I try to keep my freezer stocked with waffles too. I love hearing that Debby! Thank you for taking the time to share!